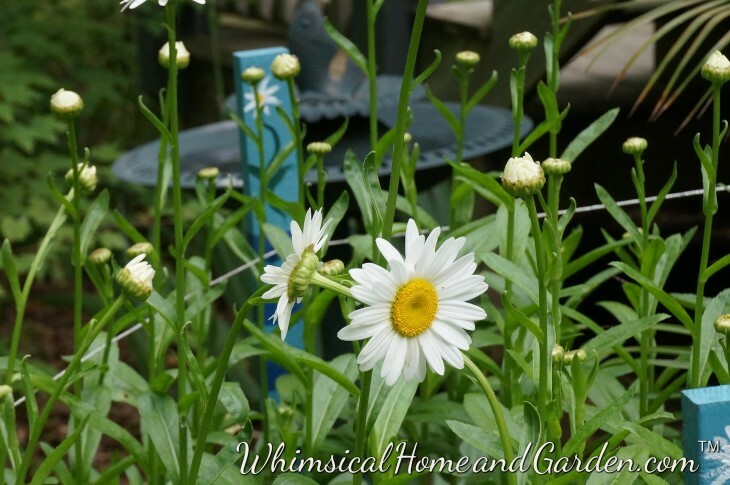 I planted a perennial daisy two years ago with an expected height of 24 inches. Well, it must have been mislabeled, because that baby grew and grew. Last year, as is often the case, we had summer storms that had significant winds, enough that it blew the stems over. By that time, August, they were near 5 ft tall! 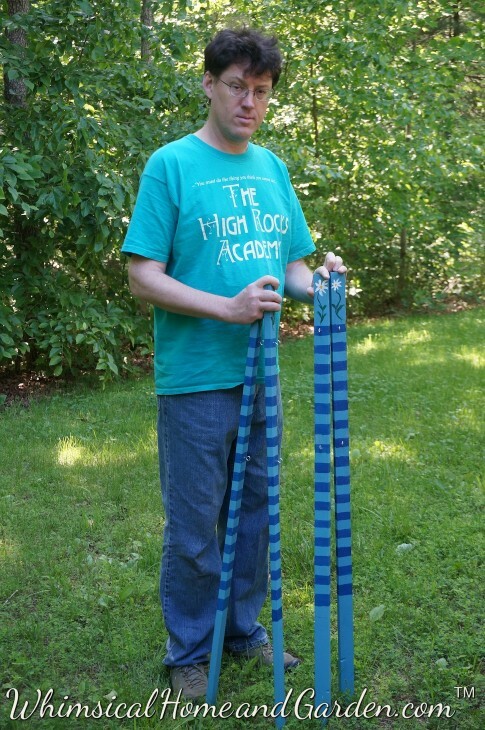 I tried tying them, but it didn’t look very nice, and it didn’t really work…..the entire “bunch” blew over. Hoops are not tall enough, and Tomato cages were not broad enough. 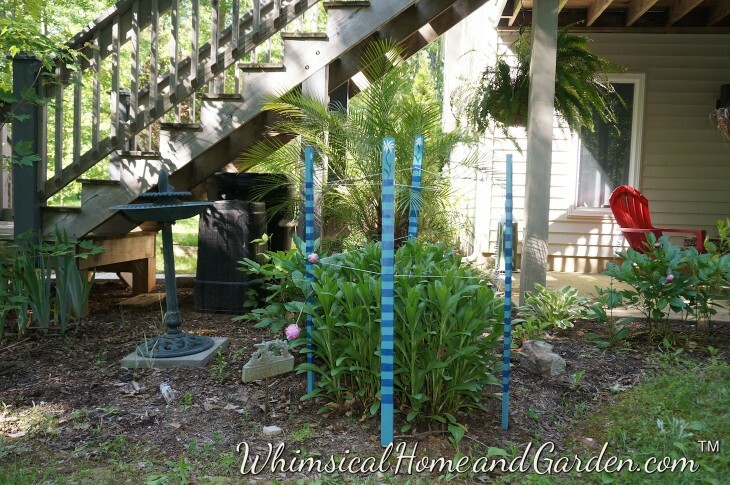 So I decided to take and embellish some garden stakes. I started with some 5 ft wood tomato stakes. Here is what I did. I first sanded the stakes quickly with my palm sander. 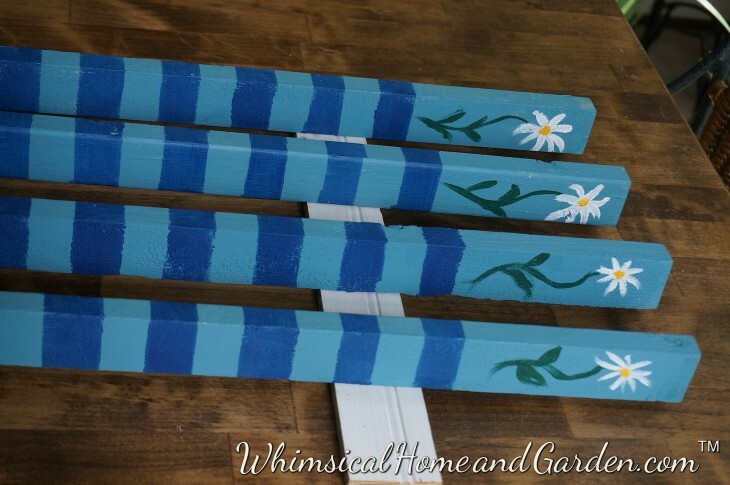 I then painted them with some leftover exterior paint from another project. This is one way to put to use all the small amounts of paint taking up space in the garage. Let them dry. 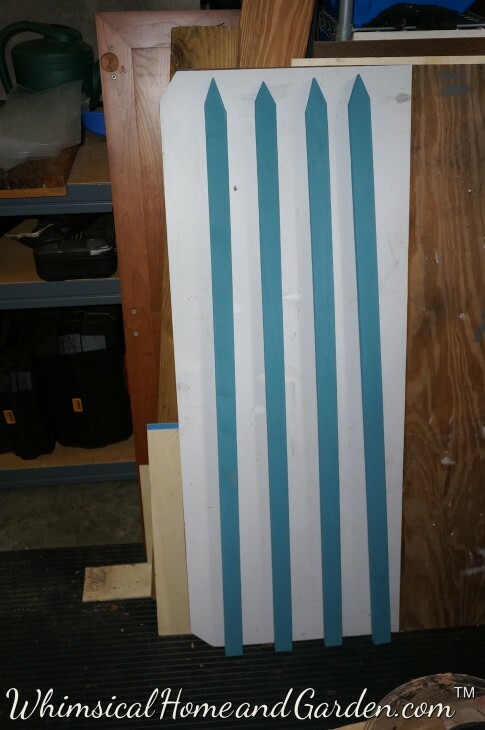 I decided to do stripes, so using painters tape I taped the first one then used it as my guide for the other three so they would be symmetrical. No need to be OCD about it. I just eyeballed it. 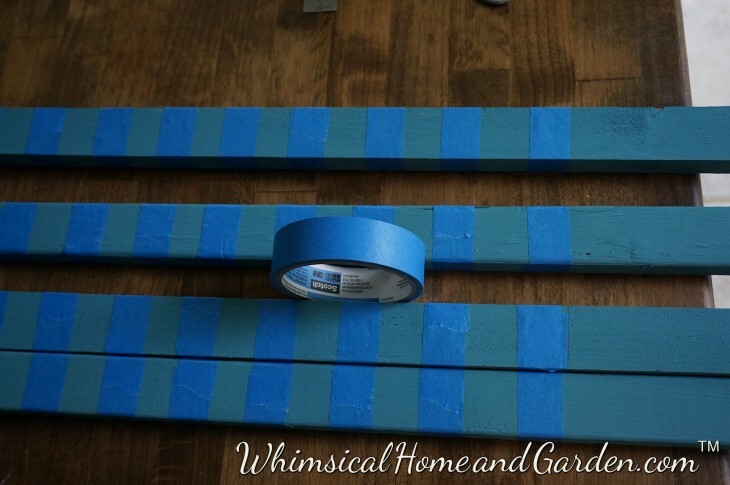 I painted the spaces with a blue that was almost the same as the tape, again a leftover. 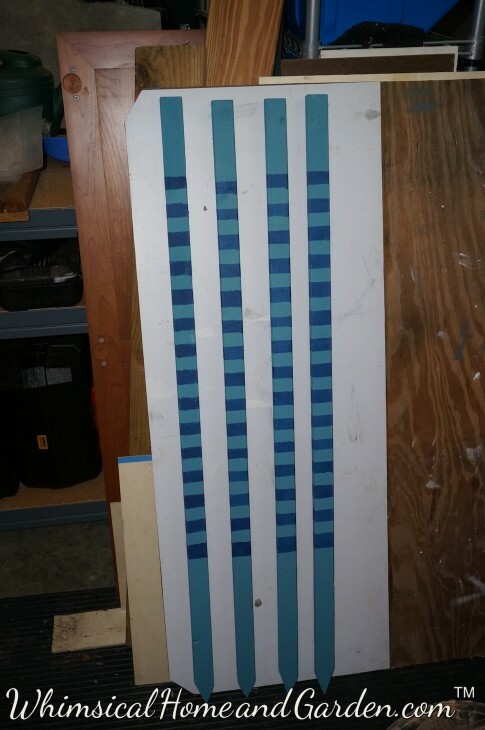 As soon as I painted the entire length of the stake with the blue, I went back to where I started and then took off the tape. Much easier, and you will see in photos further down, it worked just fine. Back out to the workshop to dry until the next day. The next morning I painted on a quick flower design. Took less than a minute for each stake doing both sides. I let it dry for a couple of hours and then, using exterior spray polyurethane, I put on two coats from top to bottom. It dries quickly. kbj helped me place them. We hammered them about 10 inches into the ground and then screwed eye hooks, one about 6 inches from the top and one 18 inches from the top into each stake. 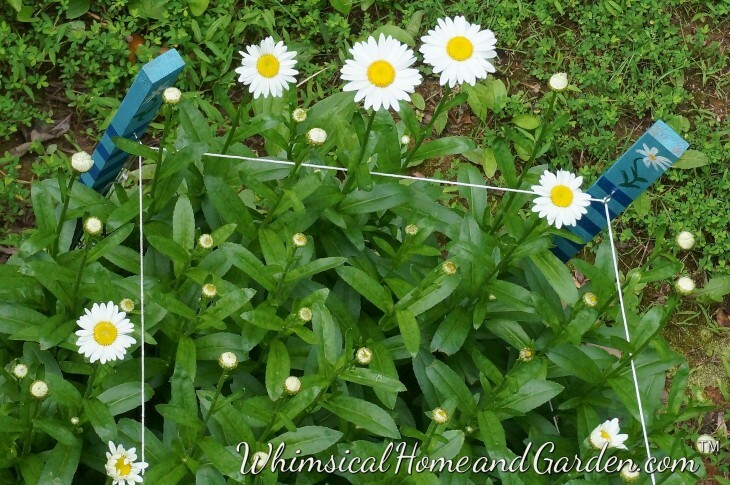 We then pulled string from eye hook to eye hook at each level to make a sort of circle enclosing the daisies. 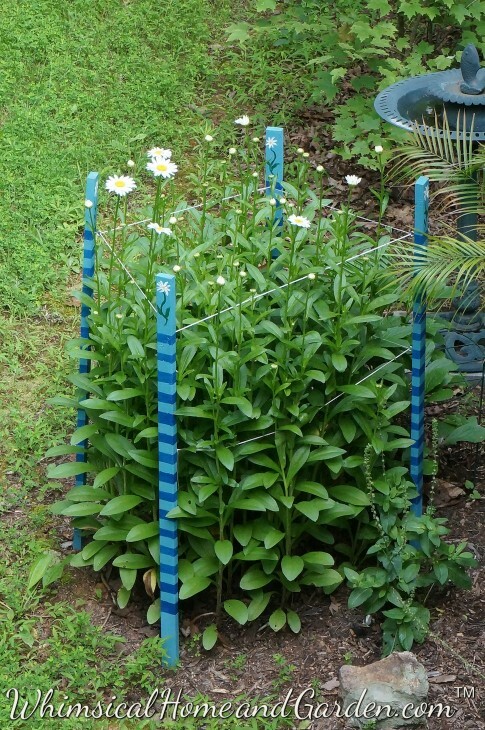 Here you can see the stakes and the string circle. 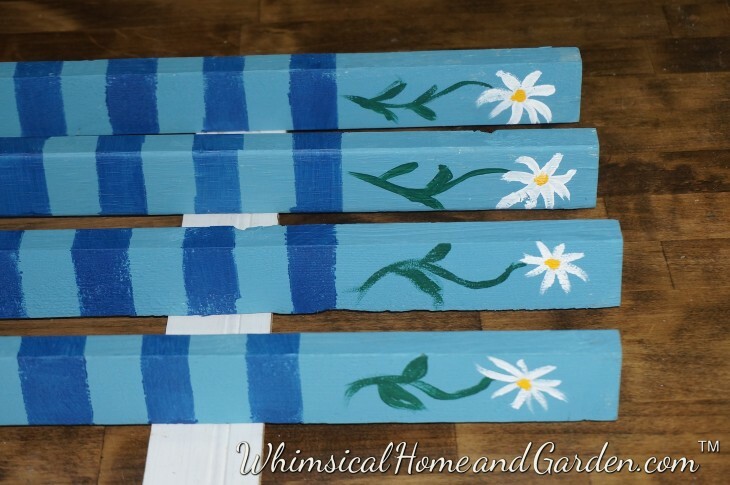 We did this on May 25th when the daisies were still growing and upright. 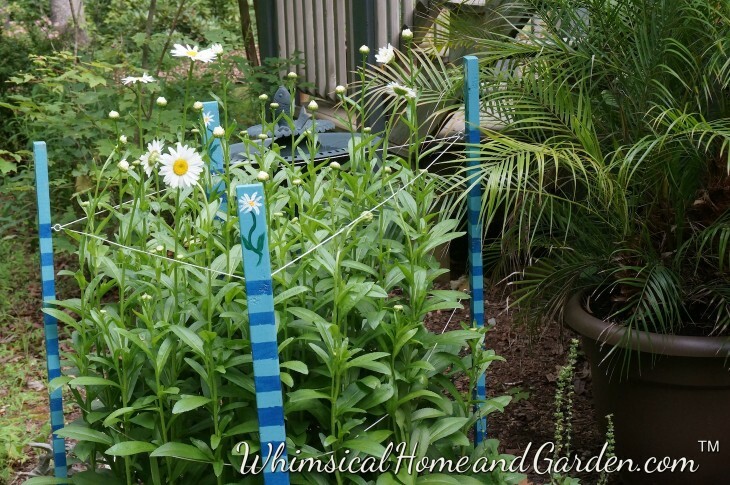 I checked on them while walking the gardens almost daily and tucking them under the string as the daisies are growing. A couple of peonies are using it for support as well. Here we are a month later and the daisies have reached the top. 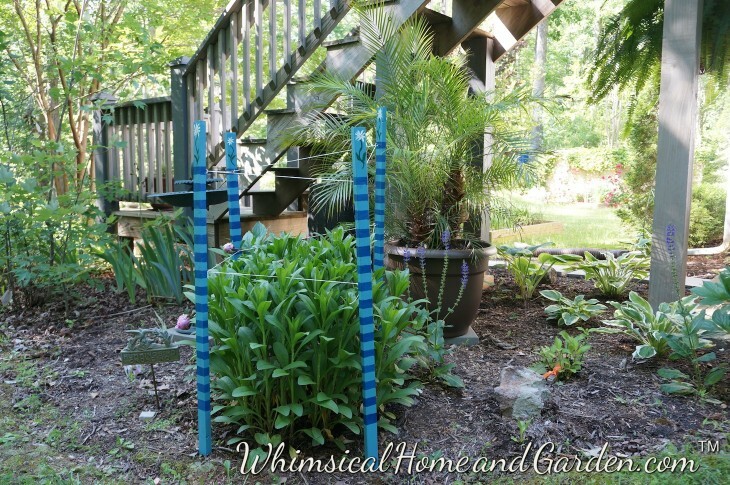 By next month they will have grown another foot if they follow last years patterns, but they should stand straight and true, while adding a bit of colorful whimsy to the garden. Look at all the flower buds! I also tucked the remaining stray stems. Thanks Cindy. 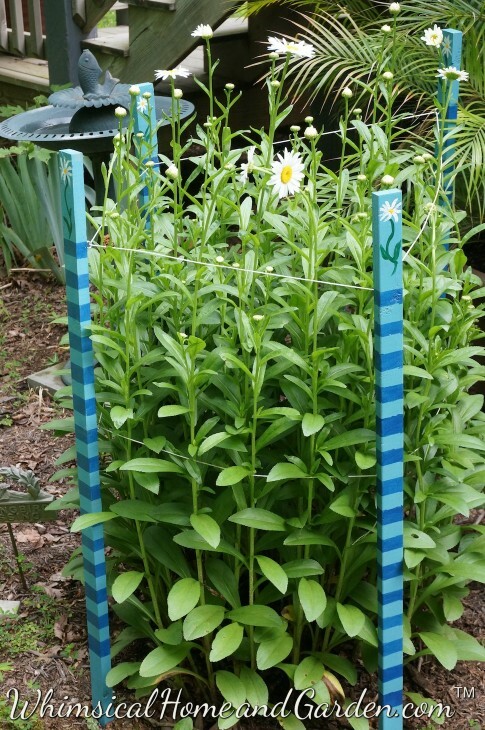 Unfortunately, the stakes remain, but the durn ole voles ate the entire root system of the Shasta daisies that were held up by those stakes. I am hoping that some “volunteers” might come up from seed, but so far not looking so good. Ahhhh, the trials and tribulations of the gardener. Thanks Leslie, I have challenges with squirrels, and this year the deer. They are all my hosts along each side of a very long path. This little project was one that at least protected one thing the deer don’t like! What a great idea! I can do that to my lilies and peonies! 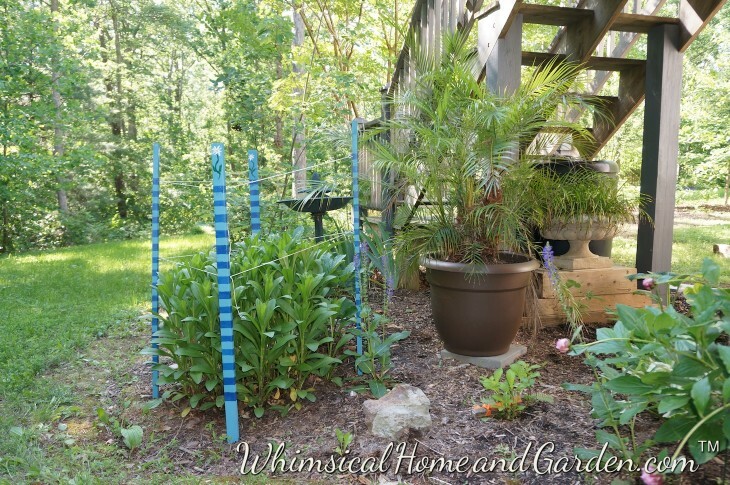 Those are the next plants I am going to use decorated stakes for…..I am making some for the peonies now. As they mature, the hoops just don’t work very well. Thanks Victoria. It really was fun and fast. Don’t we just love those kinds of projects ? !